Q1 2012 data from Reis.com indicates the bull run in Apartment fundamentals continues. Nationally, vacancies fell to 4.9%. Reis notes this is only the third time in their 31 year history vacancies have fallen below 5%, and last seen in 2001. The continued strong performance is bringing valuations of existing properties well within the range of replacement cost, which is the benchmark for establishing feasibility of new development. The chart at left from Reis reflects the trend which began with the rise in rent growth in Q1 2010. 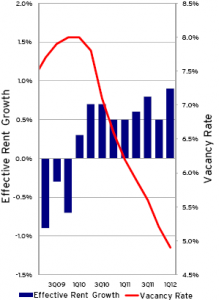 As pricing power the rental market strengthened vacancies started falling. They will continue to do so until new development catches up. However, due to continued tight credit conditions the development pipeline is not filling up as it would in a normal cycle. 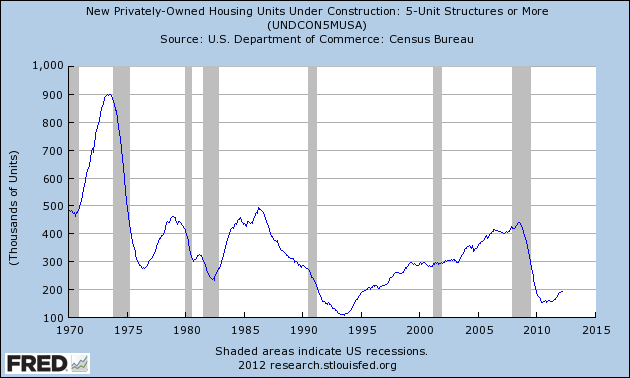 Multi-family construction starts through March 2012 are at a seasonally adjusted rate of 195,000 units. That’s a 25% year-over-year increase in multi-family construction from March 2011, but a longer view is necessary to put that into proper perspective. 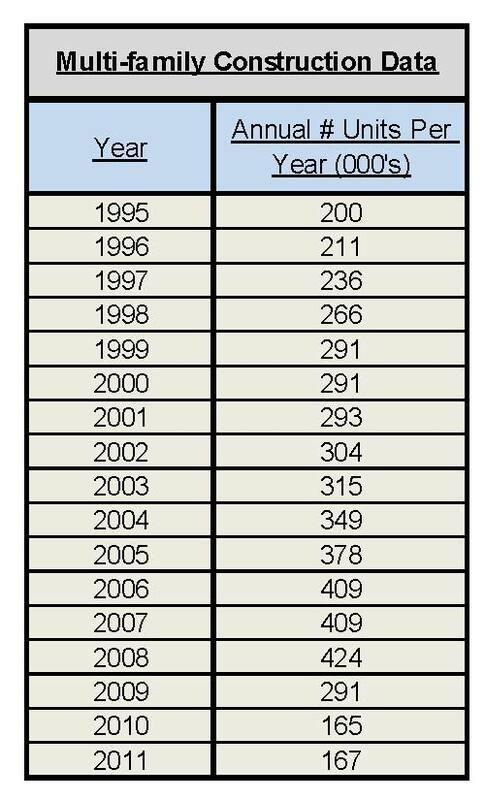 Consider that the average number of multi-family units constructed per year from 1995-2011 is 294,000. Post-recession construction typically rebounds by 50% or more, Last year (2011) saw 167,000 new units constructed, with 165,000 in 2010. The following graph from the St. Louis Fed reflects the data from 1970. Seen in this perspective, the talk of over-development is premature. As can be seen, we are barely back to 1995 level of 200,000,which was also a post-recession year. This is the basis of my position that the current up-cycle in multi-family will run significantly longer than past cycles. Industry projections for 2012 hover around the 200,000 unit level. My personal projection is for closer to 250,000, based primarily on the stable performance of the architectural billings index, the proclivity of banks to follow the herd into loans for a winning category, and the pent-up demand from developers to build anything that will get things moving again. Also at work is the the increasing demand from the fallout in single-famly housing. The analysts I read and respect, in particular John Burns and Gary Shilling, are projecting continued rental housing demand of 800,000+ per year for the next several years. I’ve got a host of data, charts and background on that topic in my new 2012-2013 forecast. All trends point to a continuation of higher rental demand, still falling house prices, and continued tight credit which affects the single-family buyer as well as developers. If the is a caveat to the good news in multi-family housing it lies in the falling affordability of houses. The slow development pipeline of multifamily potentially sets up an earlier bottom for single family housing. With rents tight and likely to get tighter, buying becomes a better and better deal (for those who can get a loan), and induces investor demand for purchasing houses out of distress portfolios. This is good news in a different form. As I have long believed, there is no recovery until housing recovers, and any market-based solution to finding the bottom has my support. To avoid a too-long post, I will recap the office and retail performance for Q1 2012 in a subsequent post.